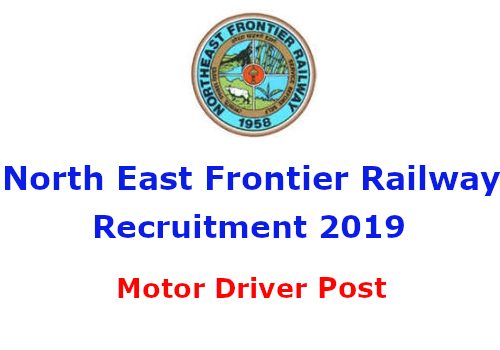 On 26/02/2019, NF RAILWAY announced Job notification to hire candidates who completed 10TH for the position of Motor Driver. 1. Staff retired from the Railway Service from Motor driver cadre can only apply. 2. The employees Removed/Dismissed/Compulsory retired as a result of disciplinary action or in a review are not eligible for Re-engagement. 3. The monthly remuneration for re-engaged retired employees is fixed as monthly remuneration determined by reducing pension from his/her last pay drawn (i.e. Basic Pay + DA). The re-engaged retired employees are not entitled to any other benefit or facilities except the monthly Remuneration. Age: 65 Years till 01-12-2019. North East Frontier Railway, General Manager (P)/MLG, N.F.Railway, Maligaon, Guwahati- 781011.
c) Valid professional driving license. e) Bank Pass Book (1st Page) Indicating AJC No. & IFSC Code. h) 03 Passport size Colour Photographs. 1. The last date for submission of the application is 18.03.2019 Staff retired from Railways desirous for re-engagement, have to submit their applications in the prescribed format at Annexure-A addressed to General Manager (P)/MLG, N.F.Railway, Maligaon, Guwahati- 781011 by registered post OR may be dropped in the box kept at lit floor Of General Manager (P)/MLG's Office, MedicaVEstablishment section within 18.03.2019 upto 17.00 hours. Applications received after the cut off date i.e. 18.03.2019 will not be accepted/entertained. 2. An interview will be held on 25-03-2019 at General Manager ( (PYMLG'$ Office. All applicants are advised to attend the General Manager (P)/MLG Office at 10.00 hours on 25.03.2019 without fail. The applications of those failing to attend the Interview will be summarily rejected.